quiltmercantileblog | News from our wonderful world of quilting! We will be closed December 23rd-January 2nd, 2017. We wish you a Merry Christmas and hope you have a wonderful New Year Celebration!!! ‘Thank you!’ to all who attended Pearl’s class and retreats over the past week. We had about 50% more ladies this year and it was a great time for everyone. We will be closed on Sundays. Make sure to visit our store for a chance to win an AccuQuilt Go! System($349 retail value) with additional dies!!! 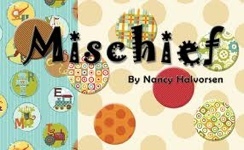 We have Nancy Halvorsen’s new children’s lines on their way! The collection is called curiosities( for girls ) and mischief( for boys ). We’ll have it online shortly, call us for inquiries in the meantime. Also arriving soon is Nancy’s Christmas Favorites Collection. All of these new fabrics are supported by Nancy’s new books. Next weekend is the Sarah Francis small blocks retreat. We still have a few spaces available. Call or email with any questions. We will be closed for Christmas and yearly inventory from Saturday December 24th through Tuesday January 3rd. We wish you and your family a Merry Christmas and Happy New Year! Many new fabrics just arrived at the end of this month. We received a new very cute coffee panel and coordinates. We received several new Moda batiks. 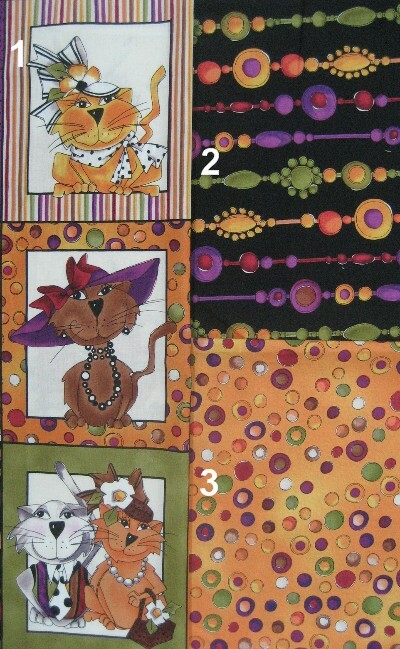 Quilting Treasures just sent us the newest Loralie Designs Spicy Cats fabric line. This picture is the very adorable panel with two of the coordinates. We just fell in love with these felines! We have uploaded images of this fabric into our shopping cart and it is available for you to buy online.